You might find a used Yamaha FZ1 for sale by private owner in GoGoCycles motorcycle classifieds and if you're a seller; you're welcome to post as many free ads as you'd like. You can click on the title of each classifed ad to see pictures of the Yamaha FZ1 Fazer, 2007 Yamaha FZ1,2008 Yamaha FZ1 or any other model for sale that you may be interested in buying. After you check out the pictures and the description of the motorcycle. If you want more information, pictures or have questions, you can contact the seller using the comments form that you will find located directly below the Yamaha FZ1 for sale or the seller may have left a phone number where he can be reached by potential buyers. 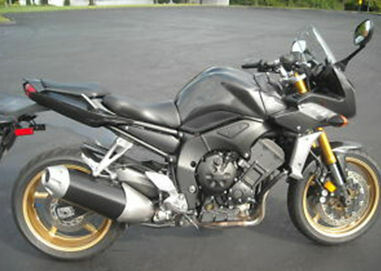 Go here to see many more Yamaha FZ1 motorcycles for sale by owner! We invite both buyers and sellers to take advantage of GoGoCycles' Motorcycle Classifieds Motorcycle Classifieds. With each and every used used Yamaha FZ1 for sale or other used motorcycle that you post here you will be helping to create one of the best websites where bikers can still find cheap motorcycles, used parts and accessories or ask for assistance with repairs, write Yamaha FZ1 reviews or to troubleshoot problems with their motorcycles. All of our used motorcycle classifieds are free and the beauty is that you do not have to renew your ad every couple of days. When you advertise your used Yamaha FZ1 motorcycle for sale here, the ad stays in place until you leave a comment telling us that it is no longer for sale or until a ridiculous amount of time passes and we come to the obvious conclusion that you just forgot to tell us that the motorcycle has been sold. The bottom line is that your used Yamaha FZ1 Fazer for sale will be perfectly positioned with the best search engine around (Google) and will be easy for potential buyers to locate. We are one of the new kids on the block but because we try very hard our ads get lots of visitors and we at GoGoCycles are very proud that our collection of used motorcycles for sale are some of the most viewed of all the classifieds on the net except maybe Craigslist and Ebay but that's ok...we're happy right where we are.